Short notice but you can't keep a good German philosophy lover down (or as Neitzsche would say "kannnichteinenUberMenschhalten"). 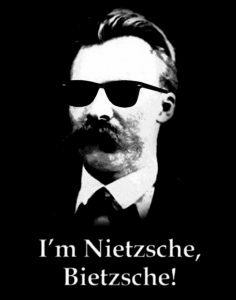 Two options for your Sunday, Justin Modra is leading a seminar on Nietzsche's Thus Spoke Zarathustra, Part I: Chp 1–10, Sunday at 5-7pm EST. Nietzsche's got some dope rhymes, so check it. Also this Sunday, Preston Price is leading a seminar on Hegel's Science of Logic, Introduction through Chapter 1 in Book 1, Section 1. 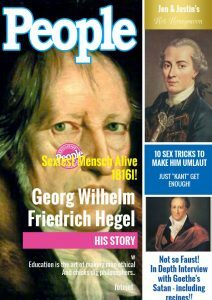 Most of you probably know him as People's "Sexiest Mensch Alive 1816" but there's more to Hegel than just a pretty face. His Science of Logic was a hit follow-up to his Phenomenology of Spirit and builds on his ideas of "being" in terms of science and logic. Coming up on May 15th, from 5pm-6:30pm EST, you're humble author is leading a seminar on Descartes' Meditations on First Philosophy, Preface through Book III. We'll be digging into Descartes' thoughts on the concept of doubt, the mind-body relationship, and the existence of god. So basically a rehash of Season 4 of Real Housewives of Atlanta, but still good stuff in there. Two more seminars that are still in the work are Mary Ricci's proposal looking at the 2016 US Presidential election candidates position papers and Michael Murray's Film as Art looking at the great works of cinema and how they stand up as works of art. Don't like any of these options? It's not too late to propose your own group for May. Just go to the Citizens' Forum and post your idea. Here's more info on how to propose a group. If you record your group meeting and submit it for us to post back to Citizens, we'll send you $25. To register for any of these seminars or organize your own, you simply have to become a PEL Citizen (meaning pay $5/month, $5 being a crazily low rate to pay for this kind of personal interaction and instruction, and of course it also includes the full-length, ad-free versions of the entire PEL podcast back catalog). Read more about Not School.